256 pages | 154 Color Illus. Emergency ophthalmology is an area full of pitfalls for the unwary primary care practitioner. Vitreoretinal disorders make up the majority of emergency sight-threatening conditions, and a wide and increasingly varied range of conditions of the eye present in primary care settings. Correct diagnosis at initial presentation, and appropriate and speedy referral, are extremely important. This book is therefore an essential reference for the primary care physician, who is often the first to see these patients and is in a position of responsibility for decision-making. Professor Williamson has over 28 years experience in the care of the eye and 20 years as a vitreoretinal specialist. He is a senior consultant Ophthalmologist at St Thomas' Hospital, London, and an Honorary Clinical Lecturer at King's College, London. He is a visiting professor at the Faculty of Engineering and Physical Sciences, University of Surrey. His specialist area of interest is retinal disease and surgery. He trained in Aberdeen, Cambridge, Glasgow and London, UK. He possesses an international reputation for surgery and research in ophthalmology. He has written a highly successful single author textbook, Vitreoretinal Surgery (second edition, 2012) which is a premier text used by trainees and surgeons internationally. He has contributed book chapters to many other texts. A second surgical book Intraocular Surgery is soon to be printed by Springer. 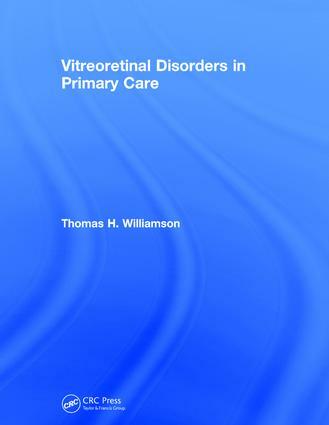 Tom H Williamson has a long track record in academia in ophthalmology. He has been particularly interested in the application of technology in sight impairing retinal disease. He was a member of a team who were the first to apply artificial neural networks in the diagnosis of diabetic retinopathy from retinal images, has described new clinical and surgical methods and has previous experience of computerized modeling of surgery. He has 160 publications on clinical topics in vitreoretinal surgery and ophthalmology making him one of the premier opinions in vitreoretinal surgery internationally. This has been facilitated by his design of an electronic patient record (VITREOR) the first of its kind in the recording of retinal disorders and with a dataset of over 8000 patients over 17 years. This has been used to look at disease patterns, symptoms, surgical outcomes and complications. He has had many leadership roles including Ophthalmology Training Program Director in London, and Director of Consultants Eye Surgeons Partnership South London and the London Claremont Clinic. The training program at St Thomas for vitreoretinal surgery is regarded as one of the premier programs in the UK. He has been providing medicolegal opinions since 1998, and selects 5-10 cases per year for expert opinion.